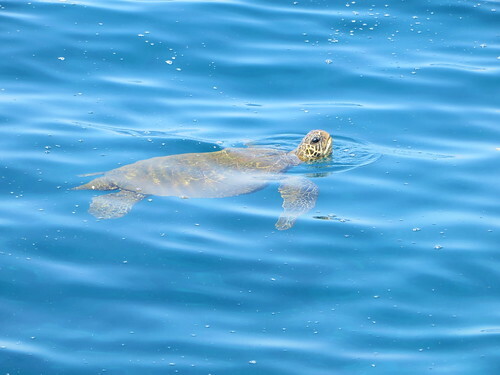 I am slowly working my way through the zillions of Hawaii photos and stories I want to share here. 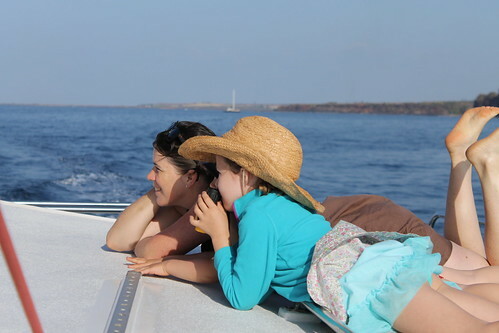 One highlight was a beautiful catamaran tour we went on up the coast that included lots of wildlife viewing, yummy meals, amazing snorkeling and an all around great family time. I see you! 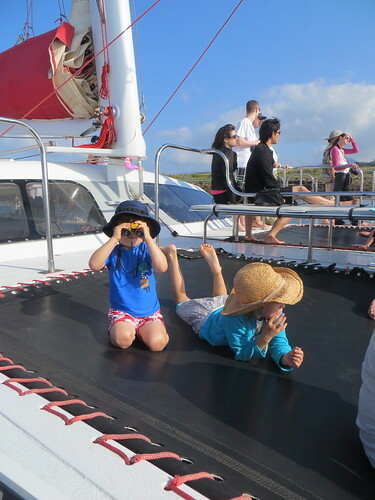 The binoculars and this trampoline area of the catamaran both provided lots of entertainment for the kids during the 5 hours we were on the boat. It was difficult to convince Porter that this type of trampoline was not for jumping. 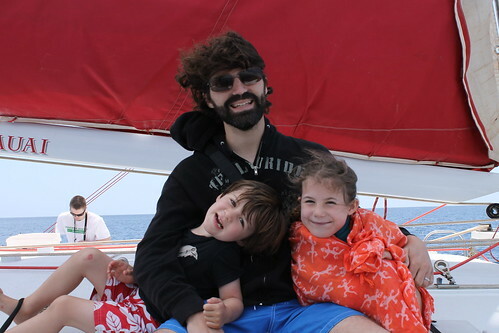 I have such strong memories of sailing with my family as a kid so it was a real treat to make some boat memories with the kids. 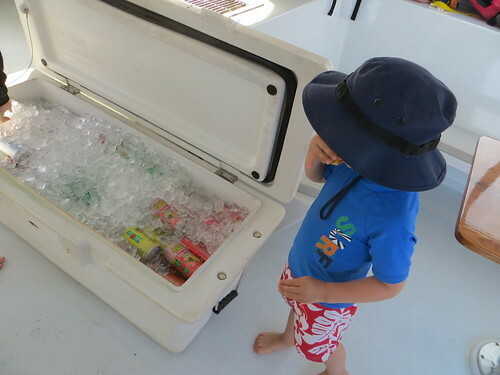 Porter was very content with the endless supply of drinks, namely these awesome tropical juices. Tim got to flex his photo-taking fingers. 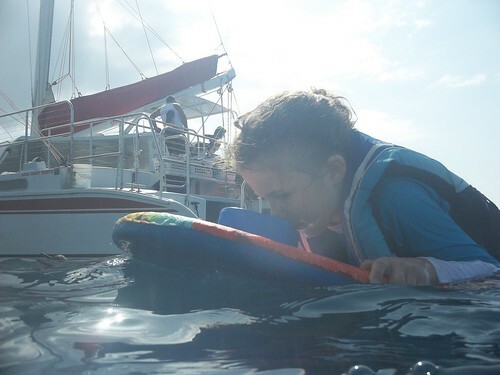 Matilda was raring to go and one of the first ones off the boat to snorkel. I was nervous Tim and I would not get to snorkel for very long if the kids got tired or cold, but they lasted longer than lots of the adults snorkeling in our group. 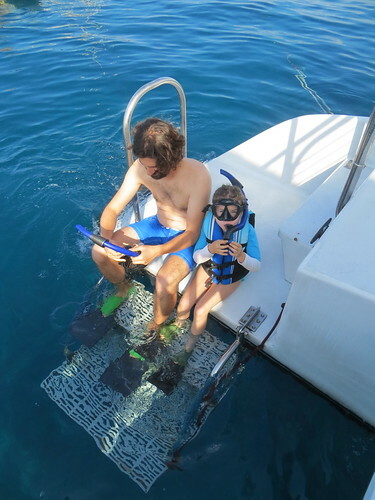 The crew had these boogie boards with snorkel viewing windows for the younger kids. 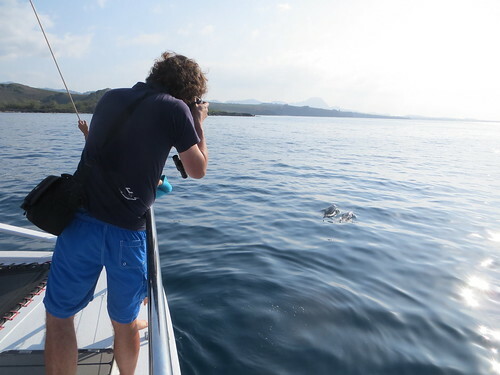 Porter used it for a bit and was tickled to see some fish below but even more excited when he would catch a glimpse of my flippered feet. 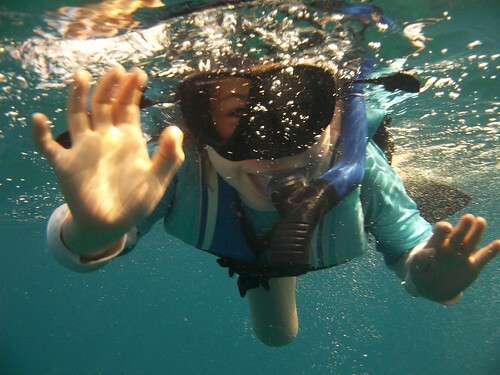 Porter didn't ever get the hang of the snorkel mask and for this outing spent most of his time riding me piggy back while I snorkeled. It was actually not as hard as you imagine. I just used the boogie board out in front of me for a bit more floatation support and could cruise around to see whatever I wanted. He chattered away to me from my back and I was content to know exactly where he was, for once. 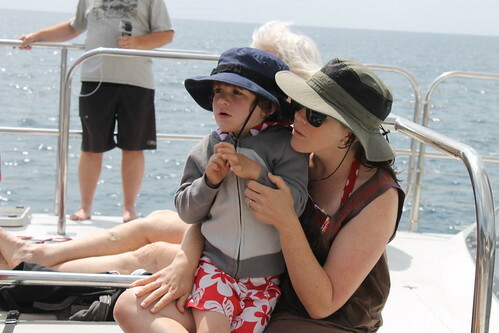 Definitely a win-win situation since I got to snorkel for a decent amount of time and he got to be glued to mom like he prefers. 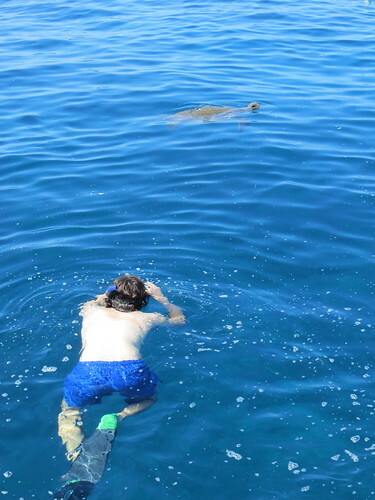 Tim snorkels with a Green Sea Turtle friend. After the snorkel we sailed slowly for a few more hours, enjoyed lunch, cozy snuggles in laps with sweatshirts, beers, macadamia nut cookies and lots more scenery and whales. I am so lucky with these three. At the very end of the day the crew gave us a chance to experience why they call the front area the trampoline. They picked up the speed a ton and showed us how you could lay down on the mesh and hold the side edges. As the boat goes flying over the waves, your whole body would fly up in the air. It was a super fun little thrill ride. The kids were totally freaked out by bumps and cold spray and wind during the mini version the captain did for them. After that trial the kids went into the lower cabin area and were thrilled to watch Tim and I take turns riding the trampoline!